Replacing doors is an affordable way to quickly enhance and upgrade the appearance and decor of a home. In addition, replacing a front entryway door can add curb appeal and improve energy efficiency. But before you run off to the home improvement center, take a few minutes (and some careful measurements) to consider all the options available in both exterior and interior doors for your home. 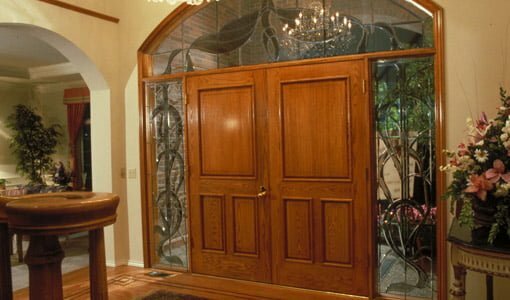 Wood doors come in an almost endless variety of colors and styles with either a large or small amount of glass or none at all. While wood offers the benefits of natural and traditional beauty, it is best used in an entryway that is covered to protect the door from too much exposure to the elements. Metal (steel) doors offer the benefit of being very affordable and extremely durable. However metal doors cannot be stained, only painted. A more popular choice in exterior entry doors today is fiberglass. Fiberglass offers all the beauty and versatility of a wood door along with the added benefit of tremendous durability. Fiberglass has little expansion or contraction with weather changes and ensures long-term and easy operation of the door. Fiberglass doors come in many styles and can be stained or painted. A smooth, or hollow core, wood door is the most basic type of interior door and certainly the most affordable. They are usually composed to two thin sheets of plywood with a solid wood frame around the outside, making them lighter and therefore easier to hang. Once hung, they can be stained or painted to match your interior decor. The next step up from a smooth wood door is a paneled hardboard door made from two pieces of molded hardboard. This door is somewhat more affordable than solid wood doors. However it can only be painted, not stained, and is therefore slightly less versatile. As with any wood door, a paneled solid wood door offers both beauty and versatility, allowing you to either paint or stain it depending on the decor of your home. Solid wood doors can be made from less expensive woods, like pine or fir, or more expensive species such as mahogany or walnut. You will, however, pay slightly more than you would for a hardboard door in a similar style. Many areas of your home can be enhanced by replacing an existing door with a glass door. 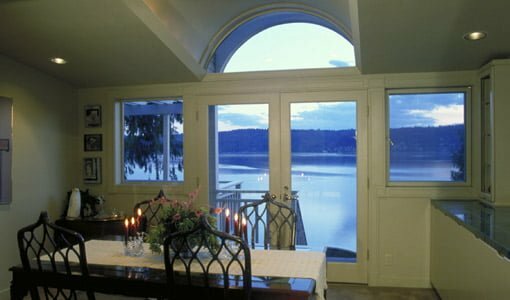 These doors can be ten lite, fifteen lite or full view glass as well as etched, leaded or beveled. Before replacing a door, start by choosing the style and materials for the new door, then decide whether you will use the existing hardware or replace it. Be sure to take accurate measurements of the existing door and/or rough opening for the frame. Remove the hinge pins from the hinges on the old door. Remove the existing door from the frame. Remove the lockset and half of the hinges on the old door. Transfer the location of the hinge mortises and lockset from the existing door to the new one. Chisel out the recessed mortises for the hinges. Drill holes for the lockset, if the door didn’t come predrilled. Attach the hinges to the new door with screws. Hang the new door in the frame, and insert the pins in the hinges. Paint or stain the new door and allow to dry. Install the lockset on the new door. Read our article on How to Replace an Entry Door to find out more. If you choose to replace the hinges with new ones, simply remove the entire hinge from the existing frame and then follow the remaining steps. Whether replacing an interior or exterior door the steps are the same. However, if you wish to completely upgrade your front entryway you may want to hire a contractor, as the process can be somewhat more involved depending on how much you wish to change around the doorway. Can you buy a fiberglass entry door to come pre finished???? Stain and top coat as well?? If so, which company?? I want less upkeep. I’m replacing the old metal door with sidelights and would like a new door that looks like wood without the hassle of upkeep. I need to replace a rotten exterior door jamb, I have done interior jambs. I am not sure on replacing the threshold. Any sugestions would help. We are building a new home and there was a mistake on the design of the Therma-Tru front door ordered. It cannot be returned, that is not an option. I would like to add wood/wood looking dividers to the glass inside and out. Is that possible? I recently purchased a home with an existing Stanley full lite door. Unfortunately the style of the lite is ugly and does not fit the style of the house. It is a 42″ door and I have already discovered it would have to be a custom door. The triple pane lite measures 62.5 X 21. Can I replace the lite without replacing the whole door? Will I lose any energy efficiency? installed therma tru fiberglass/wood door stained itand had someone come who drilled wrong hole in door for handle.he used wood putty & sanded the fiberglass. then came back wasn’t drying so used a heat gun. there are darkareas & small bumps most likely glass particles.the door is also not hung properly and need the jambs to be worked so it lifts door evenly. there is also 2 drip line fromtopcoat that ran door inside of fiberglass door that has not has topcoat applied. I am sick about it because i spent countless hours staining and working on it but was reluctant to use topcoat because i had never applied it before. now my 5000.00 door may be ruined. should i just topcoat over the patched putty hole nad bumpy area before it gets worse? Do i have to use mineral oil on whole panel or just below door handle where he messed up? I am replacing our rear exterior door leading to a patio about two feet below the threshold (three treads/steps). We are thinking of using a fiberglass door with a full light of glass. Is it more appropriate to use 1/2 lite being that you are going up three steps to the door and the fact that it is exposed to elements? Any advice would be greatly appreciated. I have a replacement 32″x80″ prehung door I am trying to install. When I put it in place there are large gaps on both sides…how do I remedy this? The house was built in the early 70’s. I’ve never heard of a closet door that opens into the closet. I would talk to the contractor about fixing it. You should be able to cut the hinge mortises on the door through to the outside, reverse the door hinges, and cut matching mortises in the door frame to hang it from the outside. Or remove the entire door and reverse it, if the door can open on the other side. We had a contractor convert our garage to a master bedroom and bath. Well, he but the closet door to open into the closet. I ABSOLUTELY HATE IT. It is such a paint as I have to walk around the door to get to most of my stuff. Can I put the door to open from the other side and if so what do I do about the hinges? We have to replace a smaller bathroom door with a larger one in our bathroom that we are remodeling. Our new tub will not fit through the 24 in door. The wall is a long load bearing wall, about 1/3 the way across. how to without tearing up a whole wall? I need to know if I can convert your basic hollow sliding closet doors to make them regular doors with hinges and handles. Would there be a problem with attaching them to the framed opening? I have an older home with 80×42 closet openings and am trying to remodel on a very limited budget so it occurred to me that I might reuse the existing sliding doors. Can you foresee any problems I might run into? thank you ben for your information on how to size my door. your info is very helpful. i can fix most things in my house but not very experienced when it comes to carpentry.Thank you for your help. I happen to be replacing an entry door on my 1960s brick house with a half glass fiberglass unit from Jeld-Wen ($189 at Home Depot) as we speak. I considered just replacing the door and leaving the existing casing, but the weather stripping and seal is so much better on new units that I decided to take it all out and install a prehung unit. I’m in luck, since my existing door had brick molding around the outside and is a good fit with the frame that comes with the unit. Older homes may have a different size molding around the outside, and the door itself may not be a standard size. You can special order doors with a custom casing, or take the one it comes with off and replace it with one that matches your door. The crucial measurements are the size of the door, which direction it opens, and the width of the jamb around it. The jamb is usually equal to the wall stud plus the inside wall and outside sheathing. So a standard 2” x 4” wall with ½” plywood on the outside and ½” drywall on the inside would need a 4½” jamb (actually 4 5/8” to give you a little to play with). You should be able to calculate your jamb by measuring the distance between the inside of your casings. I just bought an older home and it has a couple of window seals and a door kick board on rear door that need to be replaced. What is the most cost effective way to fix? I am pretty handy. I just bought a duplex with 2 sisters. We want to put in a door between the two sides. I already know it is not a load bearing wall, I now need to know how to do the project. We’ve already done many other things and your site has helped us tremendously. Thanks for any help.